ALGIERS-President of the Republic Abdelaziz Bouteflika, candidate in the presidential elections of 18 April 2019, on Sunday committed to organizing an early presidential election in accordance with the timetable set by the independent national conference, in the event of his re-election, and affirmed that "he would not be a candidate in this election that will ensure his succession." In a presidential candidacy message, which his campaign director, Abdelghani Zaalane, should read after submitting the candidacy file, Bouteflika said he was "determined" in the event of his re-election to "assume historical responsibility of meeting the people's fundamental requirement, i. e. the change of the system. I solemnly make several commitments before God and before the Algerian people." "I commit not to standing as a candidate in this election, which will ensure my succession under undeniable conditions of serenity, freedom and transparency. The date of this early presidential election will be set by the national conference," President Bouteflika wrote in his message, in which he listed six commitments. It thus undertake to "hold, just after the presidential election, an inclusive and independent national conference to debate, elaborate and adopt political, institutional, economic and social reforms, which should form the basis of the new system of renewal of the Algerian national state in line with the aspirations of our people. I also commit to drafting a new Constitution that establishes a new Republic and system, and to submitting it to the people for adoption through a referendum." The other commitment made by the President consists in "taking concrete measures to make all our young people priority actors and beneficiaries in public life at all levels and in all spheres of economic and social development." This commitment also includes "the revision of the electoral law, including the creation of an independent election organization mechanism tasked with the sole responsibility of holding elections." Speaking about his candidacy, he said that "a few days ago and in response to the requests of citizens, the political class and civil society, and with a view to fulfilling an ultimate duty in the service of our country and our people, I announced my candidacy for the presidential election. Algeria is the greatest honour that has been bestowed upon me throughout my life." 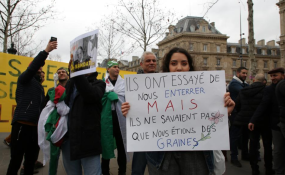 With regard to the popular demonstrations on 22 February and 1 March, President Bouteflika "praised the civic-mindedness that characterized these demonstrations" and "the exemplary professional behaviour of the various security forces." "I also welcome the attitude of all our fellow citizens who preferred to express their opinions on the polling day through the ballot box. Finally, I would like to commend the People's National Army (ANP) for its mobilization under in the fulfillment of their constitutional missions." "I listened and heard the cry from the hearts of the demonstrators and in particular the thousands of young people who questioned me about the future of our country. These young people, many of whom are of the age of dignity and generosity that I had when I joined the ranks of the glorious National Liberation Army, have expressed understandable concern about uncertainties."